Grand Caribbean East 208 - Don’t miss your spring vacation. Book now! Features: Beach Chair & Umbrella (Seasonal – Charge) / Bike Rentals (Charge) / Private Wi-Fi. Grand Caribbean East 208 is professionally managed by ResortQuest by Wyndham Vacation Rentals. Grand Caribbean East 208 provides a picture-perfect accommodation for your next vacation to Destin. This one-bedroom, one-bath condo boasts stunning wood flooring as well as elegant and welcoming décor, and is just across the street from the beach, boasting gorgeous peaks of the Gulf of Mexico. With a king-sized bed in the bedroom, twin-sized bunks nestled in the hall area, along with a queen-sized sleeper sofa in the living room, unit 208 accommodates up to six guests comfortably. Upon entering this second-floor unit, you will find the bedroom on your left, boasting bright, beachy décor, a king-sized bed, as well as a mounted flat-screen television and DVD player. The bedroom leads into the bathroom, which features a single vanity and tub/shower combination. The bathroom is also accessible from the hall area. Nestled in the hallway, you will find a set of twin-sized bunk beds, perfect for children. Down the hall is the fully-equipped kitchen, leading into the dining area and living room. The tastefully-decorated kitchen boasts lovely white cabinetry and picturesque white, tiled backsplash, along with elegant stainless-steel appliances. Step into the inviting living area, which includes matching furnishings along with a large flat-screen television and DVD player combination, perfect for a family movie night after a long day at the beach. There is a dining area in the living room, which seats up to four guests comfortably, as well as two additional barstools by the kitchen breakfast bar. Step out onto the private balcony for relaxing views of the outdoor pool area, surrounding scenic area and peaks of the crystal-clear Gulf waters. Enjoy your morning coffee out on the spacious balcony or simply take in sunrise and sunset views with your loved ones. During your stay at Grand Caribbean 208, you will also have an in-unit washer and dryer combination in the hallway, allowing your family to pack light and leave plenty of room for souvenirs. Grand Caribbean East 208 is located just across the street from the most famed white sandy beaches of the Gulf coast, on Destin’s Scenic Highway 98. Make a splash in the outdoor pool and hot tub, kick your feet up and relax by the spacious sun deck or enjoy a family barbecue with the charcoal grills on-site. Scenic Highway 98 in Destin boasts an array of family-friendly activities, including watersports and scooter rentals. Take a morning stroll down the street for breathtaking views of the surrounding beach scenery. Live like a local when you dine at the multitude of locally-owned restaurants featuring freshly-caught seafood straight from the Gulf, including 790 on the Gulf, the Crab Trap, Captain Dave’s on the Gulf and the Whale’s Tail Beach Bar & Grill. Plenty of shopping, dining and entertainment is just a short drive from Grand Caribbean East. 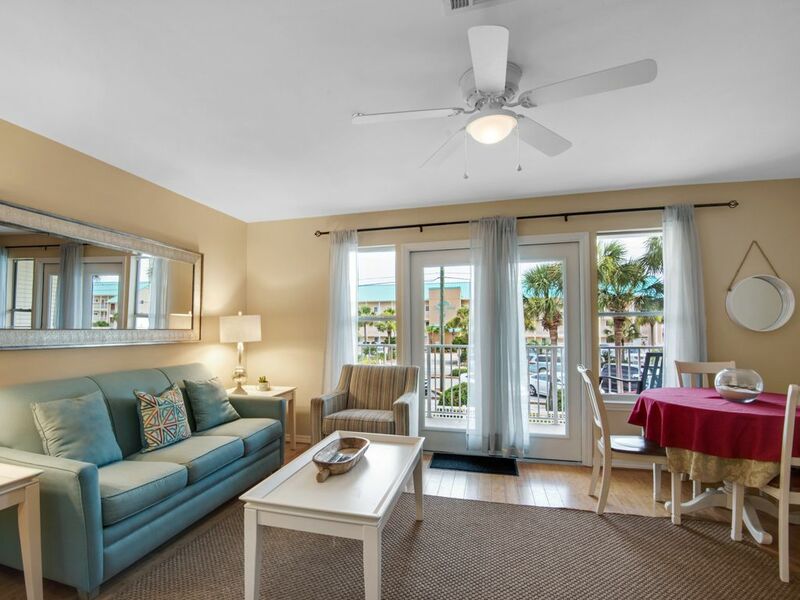 This lovely condominium complex is located in the hub of Destin, so you and your loved ones can truly experience and unforgettable beach vacation. Perfect location right across from the beach! My friends and I stayed here for a weekend getaway and loved it! It is right across from the beach! The condo was very clean and the Check-In and checkout process was very simple! I will definitely be back! Marissa, we are so happy to hear you enjoyed your stay at Grand Caribbean East! Your guest experience is our top priority. Thank you for taking the time to write a review about your vacation after you returned home. We hope you are able to visit again soon.